Our stitch markers can be slipped onto the knitting needle to mark a certain place in a row. A stitch marker is a mnemonic device used to distinguish important locations on a work in progress (WIP). It can be used to indicate increases, decreases, pattern changes, yarn changes, to aid counting blocks of stitches and more! They help with knitting, and they look fabulous on the needles. 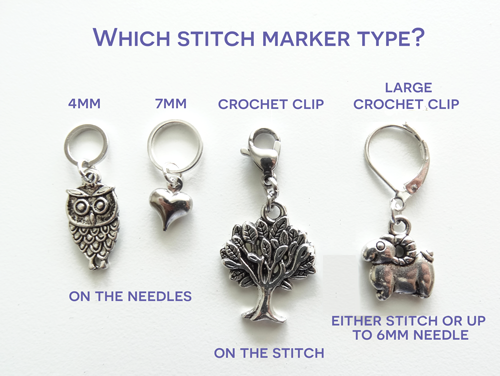 What types of stitch markers are there? Stitch markers come in many forms, they either slip over the needle or can be attached directly to the knitted or crocheted stitch. Ring markers are great for marking rows with upcoming pattern changes. The markers are sometimes split to enable removal of the marker, should it be accidentally knitting in. Dangle Free markers -are perfect for the knitter that simply needs to mark a place on the needle, or alternatively is working on a large project that calls for many markers, this is a great way to to purchase a bumper pack of markers. Clip stitch markers are best for times when the stitch itself needs to be marked. You can clip them directly into the stitch loop and then unclip them when you are done. These markers are often referred to as Crochet Markers. Why do I need to use a stitch marker for knitting? Stitch markers can be used to mark the end of a row in circular knitting, where it is not obvious where the circle begins and ends. They can also be used to mark where increases, decreases or blocks of different stitches should be placed, or simply to remind you of an upcoming pattern change. You can save yourself a fair bit of time and yarn by using a marker, as it will enable you to change pattern without realising that you should've done so half a row back! You can use them to count stitches, and they are especially useful for sock knitting to keep track of the row ends, to keep your place in patterns and great for those more tricky areas such as making sure your sleeves line up and your V neck is in the middle of your knitting. Using a stitch marker will enable you to get a much more professional look to your made up item. How do I use a stitch marker in knitting? Place the stitch marker on the needle in your right hand, then knit the round as normal for circular knitting, or use to highlight a pattern change. When you reach the stitch marker again, simply move it across from the right hand needle to the left. Remember, the stitch marker can be placed either side of your knitting. What Size Stitch Marker do I need? When choosing stitch markers, ensure that the max needle size is specified so that you know the markers will slip easily on and off your needles. This is especially important if you are a fast knitter! The simple sizing guide below will help you chose the correct marker size for your knitting project. Absolutely you can! We've sold thousands of items and our customers keep coming back. Check out the feedback from the 'Testimonials" section. Why buy Atomic Knitting markers? it's not just stitch markers that we create! We have many fibre related accessories, fripperies and bibelots for your yarn and craft projects. our markers and knitting accessories regularly feature in UK knitting magazines including The Knitter, Let's Knit, Knitting, Simply Knitting, Knit Now and Knit Today to name a few. buy the best, your knitting deserves it! Buy Atomic Knitting stitch markers! Where have I seen your stitch markers? We have been featured in various knitting and crochet magazines since 2008. We also attend knitting shows throughout the UK. You can also purchase a selection of our stitch markers from our stockists. Fab! - we'd love to hear from you! Contact us via the Wholesale section and we'll be in touch very soon. Did you know that Atomic Knitting is one of the UKs largest manufacturer and online retailer of handcrafted stitch markers? Atomic Knitting stitch markers are designed by us to be easy to use as an aid to your knitting projects. The majority of our stitch markers are snag free and won't catch on delicate yarn.